The 9x19mm Luger, also known as the 9mm Parabellum, is one of the most famous and well-known cartridges in history. It was first designed by Georg Luger in 1901 and began to see actually service in 1902. The 9mm round would eventually go on to become the standard sidearm cartridge of NATO. 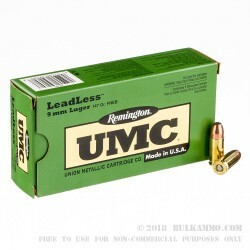 These Remington UMC 9mm Luger rounds are the 147-grain type and the have an FNEB or Flat Nose Enclosed Base lead-free design. 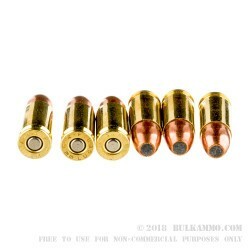 They are loaded into new, high polished, reloadable, Boxer primed non-corrosive brass cases. 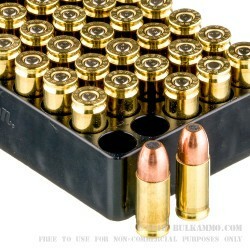 These rounds are Made in the USA, and each case contains 500 rounds, packed tight in 10 boxes of 50 rounds each. With a 500-round case, you have enough to go out and try out your new handgun, or PDW. Don't hesitate to grab more than one case so you and your friends can have days of fun. The UMC or Union Metallic Cartridge company was founded in 1867 and began by making firearms and ammunition. 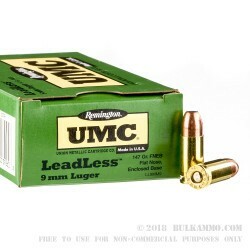 Roughly 45 years later, the Union Metallic Cartridge company combined with Remington, who was a huge firearms and ammo manufacturer at the time and created the Remington- UMC we all know today. The Remington-UMC corporation was based out of Connecticut and remained there for multiple years, finally leaving that area in 1984.